6. The iO's-"Set the Ray to Jerry"
7. This Week in History-"Daphne Descends"
8. Defined Mercury- "Geek U.S.A."
9. Digital Noise Addiction-"Not Worth Asking"
11.Mike Hamilton feat. Shane Devon-"To Sheila"
Pressing Info: Limited Edition of 200 copies, all hand-numbered. Now also available as a digital download! Production Info: Compilation produced by Act IV Entertainment. -Mastered by Jeremy Ellingsen at Swingset Sound, Villa Park, IL. -Cover art by Kate Fuller, best known for her satiricial comic strip, Billy The Ego Maniac. 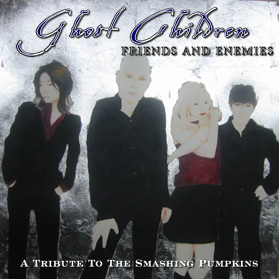 Additional Notes: A follow-up to Ghost Children, Ghost Children 2 is a 'for the fans, by the fans' Smashing Pumpkins tribute compilation. -Sponsored by The Smashing Pumpkins Internet Fan Club. -All profits go to the Make-A-Wish Foundation of Illinois. Special Promotions: For purchasing the album, you will receive a special bundle including FREE copies of the exclusi digital EPs, Ghost Children/Machines of God and the new Ghost Children and The Infinite Sadness. That's 26+ tracks for the price of 13! You will also receive access to the ever expanding Act IV archives! You will receive these exclusive downloads usually within 24 hours of your purchase!